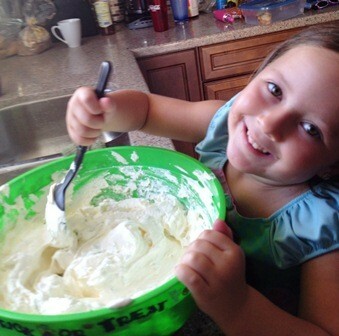 The child was putting cut-up apple pieces in a bowl and then stirring in a container of Cool Whip and box of vanilla pudding mix. I was perplexed as to what could be so hard. So I asked, why it was so tough to be a kid? In my defense she typically does more than stir, however cutting apples as I was doing was not negotiable, she was not helping with that task. So yes, she was relegated to stirring and apparently I am a slave driver!